Do you want a special gift for the very special mom-to-be? You want to have fun, not work! You need Beautiful handmade Diaper Cake! We did all the hard work for you. All you need is just to add special touches to our halfway decorated diaper cake and it will be a shower centerpiece! This cake is made of 100-120 Pampers Swaddlers diapers size 1 (8-14 lbs). The diapers are held together by curly ribbons (no glue on diapers). Cake is very sturdy and will not come apart during shipping. This cake will be wrapped in clear cellophane and tied at the top with curly ribbon. Dimensions: 20" in height, sits on a 12" Wilton corrugated cake board. 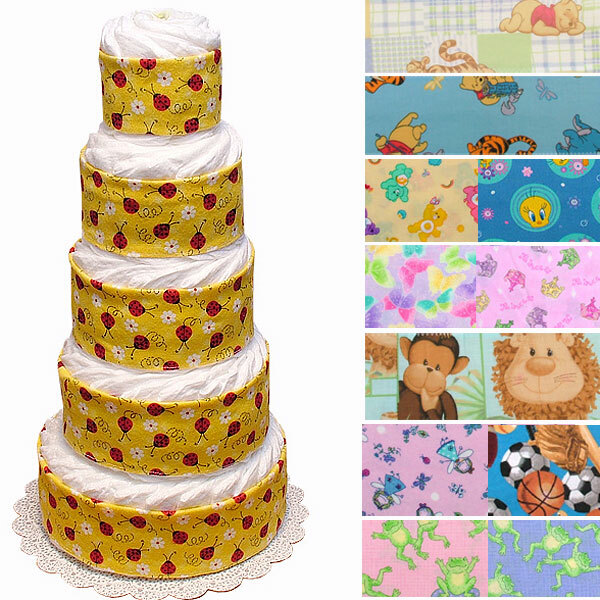 All our diaper cakes made of highest quality ingredients with greatest care and love. Everything included is ready to use and easy to disassemble.